In industries that produce powders and bulk solids, controlling moisture content can impact the purchase price, shipping costs, material handling and, perhaps most importantly, the quality of the final product. When processing dry bulk solids such as food ingredients, chemicals, pharmaceuticals, pigments, minerals, etc. the amount of moisture in the product can have a wide range of effects. A product’s quality, as well as transactions based on weight, can be adversely affected by improper moisture contents. Furthermore, the satisfaction of legal requirements that are present in many industries is a determining factor influencing a company to measure moisture content. However, until recently conducting frequent moisture content tests throughout the process or in the field has been difficult. In many cases, the primary barrier has been the expertise and time required to conduct such tests. Often sophisticated moisture measurement devices must be operated by trained personnel that can properly calibrate the equipment. Many also require meticulous sample preparation and disposal. Fortunately, handheld devices are now available that allow even less-skilled personnel to take lab-quality moisture measurements. These “point-and-measure” options allow moisture readings to be quickly taken at any stage of the process, as well as at loading docks, on trucks, at suppliers, or in bins, vats or vessels. By simplifying the process, powder and bulk solid producers can increase the quality of their products from raw material receipt and formulation to end product manufacturing and distribution. Although the reasons for measuring the moisture content of powders and bulk solids can vary, the primary motivation is to improve product quality and the bottom line. Monitoring moisture content in all stages of production ensures the most efficient processing. From measurement of incoming materials to mid‐process measurement, the optimization of plant resources and product quality will be ensured. A prime example is extending the shelf-life of powders in particular food ingredients. When moisture content is too high, mold can develop; when it’s too low, the product can become stale and the taste altered from ideal. Establishing the moisture content is also very important when mixing two substances together. If the mixing is not done at the proper moisture levels, the way the two products react can be affected. This includes any chemical reactions that might take place, the way the two are blended together, or the amount one substance is dissolved into another. It is also important to know the precise moisture content in any raw materials prior to beginning the manufacturing process. Otherwise, the product’s time in the dryer, the dryer temperature, the conveyor belt speed, and many other factors must be modified each time a new shipment of the product is introduced. Another benefit of frequent moisture measurement is for products sold based on regulated moisture content. Prescribed percentages must be met in order to comply with these specifications. In certain industries, heavy fines could be levied, while in others, the product or substance will not be accepted by the regulating agency. These industries include gypsum and pharmaceutical manufacturers, among others. There may even be legal ramifications, if the acceptable moisture content of a product is decided prior to purchase or shipping. Fees can be levied on companies that do not ship at the agreed moisture level or the product could be rejected outright. Finally, since moisture content contributes significantly to the weight of such materials, properly drying a substance to acceptable limits before it is transported can dramatically reduce shipping and disposal costs. Although traditional laboratory and online based moisture measurement techniques are useful in the right settings, they have lacked the simplicity and flexibility required for frequent spot checks. One common test is Loss on Drying, which measures the total material weight change after drying. However, such tests typically require a sample to be prepared and brought back to the lab. The test takes at least 15 minutes to several hours to perform, which is too slow when more immediate measurements are required. It also requires the sample to be altered or destroyed. As a result, secondary test methods have typically been used to deliver faster results. This type of test uses an indirect method and a single conversion to achieve accurate results. Secondary measurement techniques are routinely accepted as equal to the gold standard method. Examples are speedometers, common infrared and liquid thermometers and most pressure gauges. If there is a disadvantage, it is that the instrument must first be calibrated to ensure accurate results. In some cases, calibration could only be performed by trained staff familiar with the equipment. 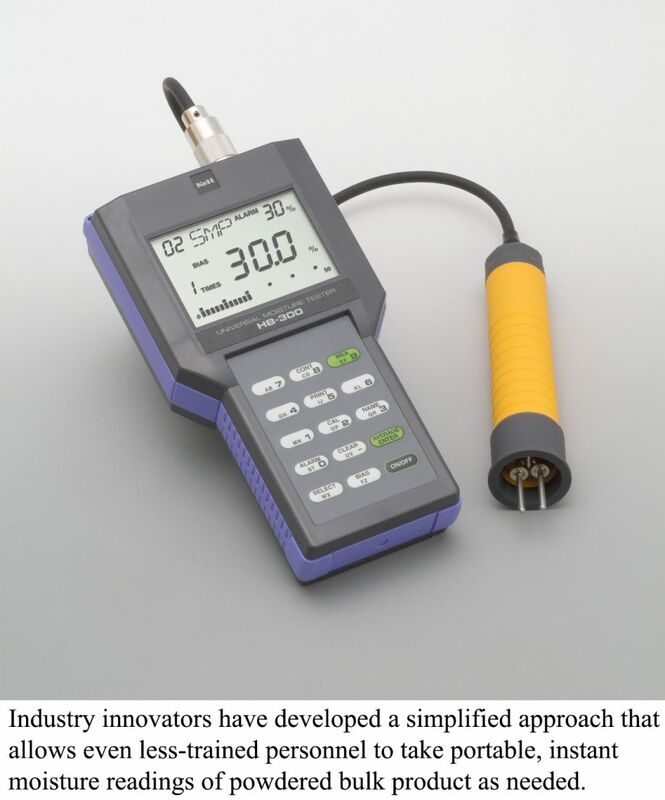 In response, industry innovators have developed a simplified approach that allows even less-trained personnel to take portable, instant moisture readings of powdered bulk product as needed. The approach involves moisture meters that utilize Near-Infrared (NIR) light, a highly accurate, non-contact secondary measurement method that can deliver immediate, laboratory quality moisture readings. In addition, because the process is non-destructive, samples remain unaltered so they can be used for additional tests or put back into the product stream. Unlike complex laboratory equipment, portable NIR equipment is designed for ease of use. 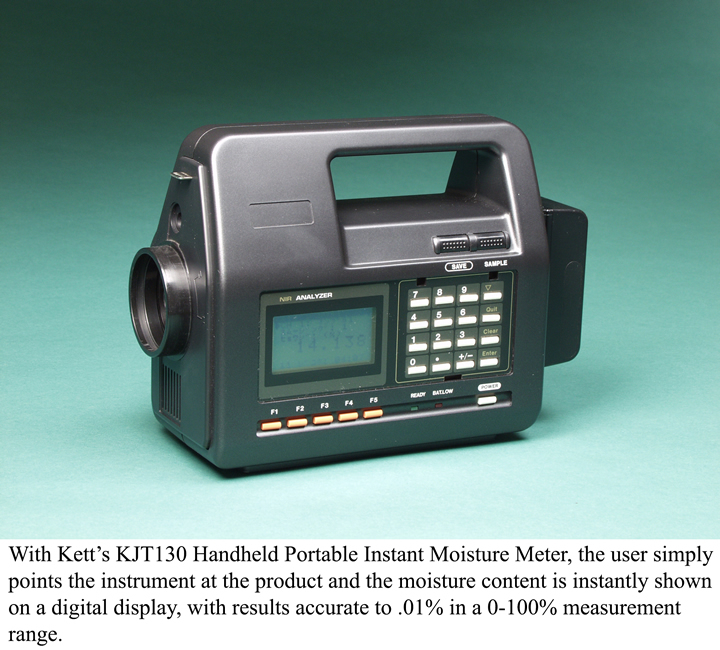 For example, with Kett’s KJT130 Handheld Portable Instant Moisture Meter, the user simply points the instrument at the product and the moisture content is instantly shown on a digital display, with results accurate to .01% in a 0-100% measurement range. Because no direct contact or sample alteration is required, particle size variation and unusual textures are not an issue. This can be important when used with a range of powder and bulk solid materials in different settings. For ease of use, the unit is operated via user friendly menu commands. The unit, which is the size of a camcorder, is designed for frequent spot checks wherever necessary, on both stationary and moving (process line) products. Moisture measurement data may be stored in the instrument, downloaded continuously, or manually recorded. “The goal is for any staff member to be able to successfully use the moisture meter wherever it is needed, with minimal required training,” says Bogart. “This allows powder and bulk solid processors to have the certainty that what they are producing is of the highest quality. “The key is to cost-effectively be able to conduct as much testing as required, with full confidence in the results, each and every time,” adds Bogart.